Windstar Cruises is now offering year-round Tahiti cruises! Enjoy a graceful sailing yacht, with only 148 guests, as you tour the French Polynesian islands in 2019 and 2020. Windstar is the perfect way to experience the true wonders of Tahiti. Let the trade winds fill our sails on board Wind Spirit as we visit one legendary island after another. Our sailing ship stays overnight in most islands to give you time to swim and snorkel the crystal-clear lagoons, meander through lush rainforests on shore and experience the fascinating Polynesian culture. From tikis to tiare flowers and from black pearls to vanilla, there's plenty of time for you to enjoy Tahiti. Book By Dec 31st To Receive Shore Excursion Credits! Imagine spending a week on a friend's private luxury yacht. Unlike the crowded cruise ships left in your wake, you are one of only 148 guests on board. Your yacht is anchored in hidden harbors throughout the South Pacific. While others wait for tenders in tedious lines, you swim and kayak off your own Watersports Platform. You step ashore into the center of amazing islands to explore the secret charms of each place. Meals on board treat your senses; prepared by a premier chef and served in intimate, impeccable style along with a superb collection of fine wines. This is your private space - from the indulgent luxury of your own stateroom or suite to your favorite spot on deck. Windstar Cruises award-winning service and style gives you the luxury of choice to enjoy what you like, when you like and with whom you like. Indulge in a fabulous five-star dinner and great bottle of wine in AmphorA restaurant. Enjoy live music and cocktails at the Pool Bar. Take a refreshing dip in the pool. Work out on state-of-the-art equipment in the gym. Treat yourself to an aromatherapy massage at WindSpa. Read your favorite book on our comfortable chaise lounges on deck. Try kayaking, waterskiing and windsurfing from our Watersports Platform. Or test your luck in the casino. On a Windstar Tahiti cruise you'll experience the smallest of wonders and the greatest of joys! Complimentary Destination Discovery Event on all Windstar Tahiti Cruises! Bora Bora is surrounded by a number of tiny islets called motu - and you will spend the evening on a secluded motu accompanied only by other Windstar guests. You will be welcomed to the motu with a traditional flower lei. Your private dinner on the beach promises to be extraordinary. Tender suckling pig will be slowly steamed in a traditional ahima'a, a Tahitian earth oven. The oven is preheated with a wood fire. Then porous volcanic rock is scattered over the wood until it is completely covered. When the fire goes out, the rocks are leveled and the pig placed on top. Banana leaves are laid over the top to cover the ahima'a completely. Finally, earth is shoveled on top so no heat escapes and the pig cooks for up to four hours until the meat is so tender it almost melts in your mouth. When your meal is complete and the stars begin to shine, the evening entertainment will begin. Dressed in loincloths, fire dancing experts will dazzle with high-speed acrobatic moves and throwing flames so hot you'll feel the warmth ten feet away. Windstar believes the ultimate luxury is an experience designed specifically to your personal tastes, just like your own private yacht. That's why Windstar gives you the freedom to make your own choices, to pick your own pleasures. All the luxuries you expect are built in - and you can add as many more as you like, making your Tahiti cruise exactly as inclusive as you want it to be. In one simple call or email, our Tahiti Specialists can help you make your Windstar vacation completely inclusive - or create a personal, custom-made experience. Would you like alcoholic beverages included - our pleasure. A perfect collection of shore excursions picked precisely to your interests - of course. Can we make all your air, hotel, and transportation arrangements - naturally. This is - luxury exactly as you like it! The Wind Spirit features wide open, teak decks. Over 10,000 square feet of open deck space for guests to enjoy the good weather by lounge chair or take a swim in the pool. There are two primary dining venues on board. The Restaurant offers gourmet, course-by-course cuisine in the evenings and the Veranda Restaurant offers a casual buffet. All dining is open seating. For dinner under the stars we suggest making a reservation for Candles, which features steaks and skewers. The Wind Spirit is a sleek, four-masted sailing yacht. It accommodates only 148 guests, has four decks and a gross tonnage of 5,350. The Wind Spirit feels like your own private yacht. Onboard Wind Spirit all staterooms have an ocean view, queen beds, flat-screen TV with DVD player, and Bose SoundDock speakers for Apple iPods. The one Owner's Suite onboard also offers a sitting area. Dining onboard Wind Spirit includes two primary venues; AmphorA Restaurant and the Veranda. AmphorA Restaurant offers gourmet, course-by-course cuisine in the evenings. The Veranda offers a casual buffet and full-service dining for breakfast and lunch. 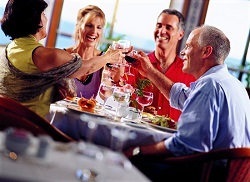 All dining onboard Wind Spirit Tahiti cruises are open seating. Wind Spirit also offers dining under the stars, called Candles, which offers steaks and skewers; reservations required. Wind Spirit also offers the WindSpa, a casino and entertainment lounge, water-sports platform, library, pool and hot tub. Enjoy a Tahiti cruise onboard Wind Spirit for a relaxed, laid-back vacation. You are on course to a world of elegance and ease onboard Wind Spirit. The journey begins in your soothing ocean view Stateroom with the shimmering sea just outside your window. May be you feel like watching a DVD from the library on your flat-screen TV. Perhaps you feel like slipping between luxurious linens for an afternoon nap. Or maybe you feel like staying right where you are and dining in your stateroom. It's a match made in heaven. You on your pristine white ship, sails billowing, and these islands, so impossibly colorful, like a box of crayons gone mad. Wind Spirit is as at-home among Tahiti's deserted motus and shallow lagoons as a tiare flower, and just as beautiful, furled or unfurled. Bliss knows no bounds. The sand massages your feet, warm water welcomes you like an old friend, ambition falls away as you watch the sun etch palm fronds on the beach. This is a place that is easy to love, difficult to leave, as so many before you have discovered. Come. Keep the promise you made to yourself so long ago. Windstar Cruises Tahiti Cruises - 7 Days From $1699 US! 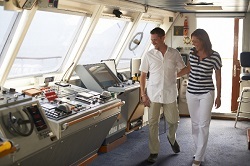 Tahiti & Tuamotu Island Cruising - 10 Days From $2199 US!